Cut refers to the shape and proportion of a diamond. Diamonds may be cut in a wide variety of shapes but the most popular are round, oval, marquise, pear, emerald, radiant, princess, and heart. While other diverse cuts are available on the market, the round brilliant cut is still the top choice. There are standards of cutting to produce the optimum of brilliance (light reflecting from the table) and dispersion (light refracting from the crown). Originally designed by mathematician Marcel Tolkowsky in 1919, his design became one standard for the modern brilliant cut today. In cutting to these proportions, a cutter must often be willing to sacrifice much more of the valuable rough to yield a diamond of superior beauty but of far smaller size. 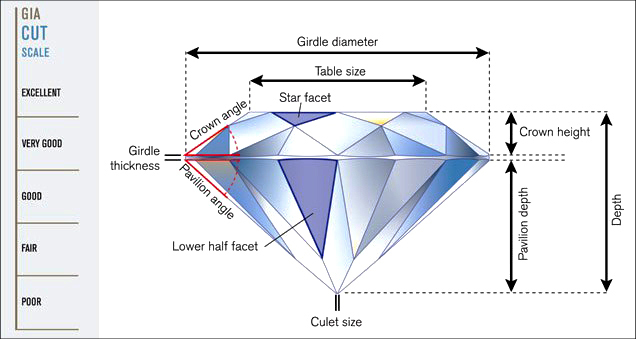 Most diamonds are cut for weight retention, which often results in a deviation from “good proportions”. Often, the Diamond Cutter will sacrifice some of the beauty of the stone by cutting for a minimum of weight loss from the rough, which usually deviates from ideal proportions, but gets a larger finished stone. The truth is that less than 5% of all diamonds are cut to ideal proportions. Care must be taken to avoid buying a stone that has been cut too far from the “excellent” proportions. When a stone has either a very shallow or very deep cut, light is lost through the sides and bottom of the stone (pavilion), reducing its brilliance. Since cutting a stone that has the “very good to good” cut or proportions usually results in a smaller carat weight stone. 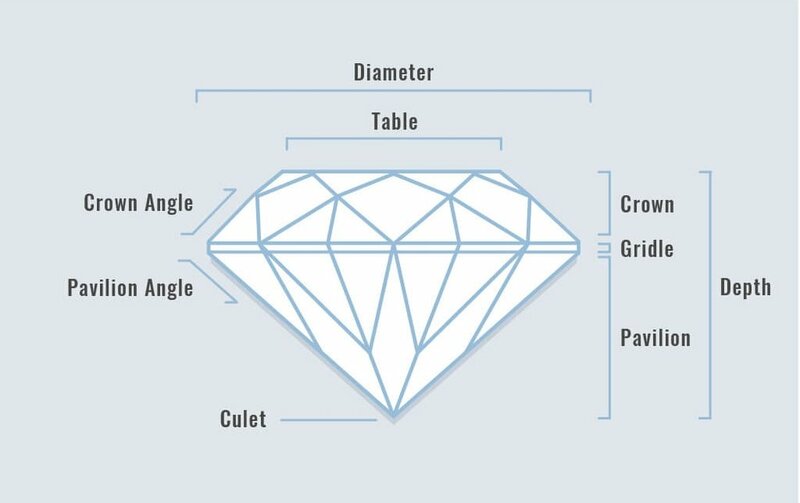 The term “Ideal cut” is used to describe a range of dimensional tolerances that produce exceptional quality diamonds in terms of brilliance and dispersion. The term “Ideal Cut” does not intimate a single set of dimensions. It is highly unlikely that there will ever be a single set of dimensions that will be universally accepted as the “Ideal Cut” as there is a relatively large range of dimensional possibilities that produce exceptional diamonds. ICE Brand diamonds are selected from a range of tolerances that are included in both American and European standards with a special emphasis on visual beauty. Most Diamonds contain inclusions. Sometimes they are incorrectly referred to as “carbon spot”. In reality they can be a myriad of things from other minerals such as carbon or even a garnet. There can also be minute fractures within the stone. Whatever they are, they are the internal characteristics of the stone. It is what makes each diamond unique. You should learn to recognize the “birthmarks” in your stone as they are an easy means of identification. The Clarity Grades as defined by the Gemmological Institute of America are generally accepted throughout the world. Each has a very specific meaning. The grading takes place using 10x magnification using either a loupe or a gem microscope. As can be expected, the fewer inclusions, the rarer, thus the more valuable the stone.